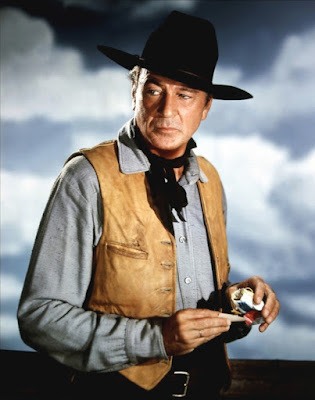 Man of the West (1958), starring Gary Cooper, is one of the 1001 classic movies you should see. Each Monday, I'm going to recommend a classic movie you should see (for the reasons behind the 1001 series and reviews of earlier films covered go here). Throughout April, I'll commemorate the 400th anniversary of English playwright William Shakespeare's death (he died on April 23, 1616) with a look at some of the best old Hollywood films inspired by the bard's work. This week's selection is the classic Western, Man of the West (1958), which has a character that is based on King Lear. Man of the West tells the story of Link Jones (Gary Cooper), a former outlaw who is now an upstanding citizen in the town of Good Hope, Texas. The townspeople have entrusted Link with the task of going to Fort Worth to hire a teacher for the new school, but when Link and two other passengers (Julie London and Arthur O'Connell) get left behind after a train robbery, he is forced to go to the home of his Uncle Dock Tobin (Lee J. Cobb), who was his former partner in crime, for food and shelter. Man of the West is based on the 1955 novel, The Border Jumpers, by Will C. Brown. Producer Walter Mirisch acquired the rights and hired director Anthony Mann, who was well-regarded for his work on several "adult" Westerns, such as The Man From Laramie (1955), Winchester '73 (1950) and The Furies (1950). Cooper was chosen to play Link after Mann rejected Stewart Granger and James Stewart as wrong for the role. 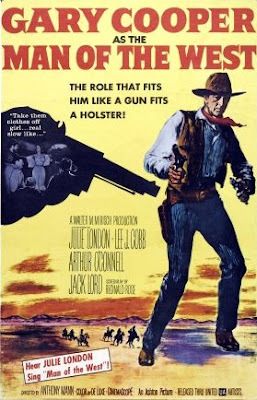 Man of the West was a box-office and critical failure when it was released in 1958, but it has since gained a cult following, especially among French cinephiles. Mann had long wanted to make a Western version of King Lear, but he died before that movie could go into production. The closest he came was Man of the West, which features a Lear-like character in Uncle Dock. Like Shakespeare's mad king, The old outlaw has lost much of his grip on reality -- Link tells his cousin that, "things have kinda gone to hell around here" which is, to say the least, a huge understatement -- but he still rages against those whom he feels have wronged him. Link is at the top of that list -- Dock feels that his "favorite son" abandoned him when he went straight -- and he lets loose his scorn and contempt for Link in a series of blustery speeches that echo Lear's soliloquies. 1. Cooper. Cooper had not made a Western film in five years, but he eagerly accepted the part because of the complexity of Link's character. Man of the West is the last great performance of Cooper's career. He is superb in both the movie's comic scenes -- Link's first train ride is one of the highlights of the movie -- and in Link's darker moments. 2. Cobb. Cobb, who was one of the great American actors of the 20th century, was actually several years younger than Cooper, but he is completely convincing as the bitter octogenarian. Anyone who's seen 12 Angry Men (1957) knows that Cobb does blustery rage well, and he is exceptional here as a man whose uncontrolled anger has destroyed his family. 3. Fight scene. Mann's films are exceptional among old Hollywood Westerns for their use of violence. Man of the West is no different, featuring an extraordinary 8-minute fight scene between Link and his cousin (Jack Lord) that anticipates the more violent Westerns from directors like Sam Peckinpah and Quentin Tarantino. 4. Ernest Haller. The great cinematographer Ernest Haller shot Man of the West, and it is perhaps the most beautiful of all Mann's Westerns. Mann and Haller's use of the landscape to tell the story is breathtaking. Other critics: Man of the West is one of the few movies that are rated 100 percent fresh at Rotten Tomatoes, and Leonard Maltin calls it a "powerful story that deserves another look" in a three star review for his Classic Movie Guide. Critics in 1958 weren't quite so enthusiastic. The New York Times Critic Howard Thompson called Man of the West "a small picture" but praised its "cryptic defiance and aura of snakelike evil." However, French critics heaped praise on the movie. Jean-Luc Godard, who was then a writer for the influential magazine, Cahiers du Cinema, penned an unqualified rave. "I have seen nothing so completely new since - why not? - Griffith. Just as the director of Birth of a Nation (1915) gave one the impression that he was inventing the cinema with every shot, each shot of Man of the West (1958) gives one the impression that Anthony Mann is redefining the Western. It is, moreover, more than an impression, He does re-invent," he wrote. 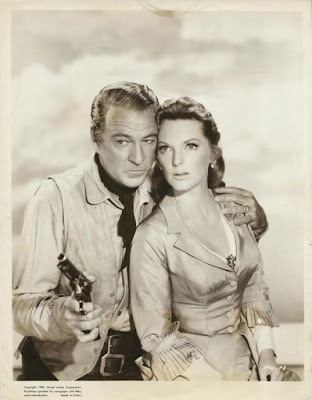 Gary Cooper and Julie London in a vintage lobby card for Man of the West (1958). The bottom line: In my opinion, Man of the West isn't quite as good as Mann's Westerns with James Stewart, but it is still a great movie with beautiful cinematography and Cooper's last great performance. Availability: Man of the West is also available on DVD, Blu-ray, and video on demand. Next week, I'll wrap up the Shakespeare theme by looking at the comedy, To Be or Not to Be (1942). The Cooper/Lord fight scene is brutal. In fact, that's a word I would use to describe all of the violence, both physical and psychological in this intense movie. It is brutal. It's actually quite shocking to see Gary Cooper that angry.